No rest for the wicked as they say. Today's lunch brought us back to Beak Street for something a little more substantial than last night's frozen yoghurt treats. Bob Bob Ricard - Soho's designer diner dishing classy comfort with Anglo-Russian panache - has recently introduced a new “Let Them Eat Caviar” lunch menu, which we were chuffed to sample when invited. Priced £19.75 (not cheap, we know, but it is caviar), the menu includes ten grams of caviar with blinis and sour cream, a shot of Russian Standard Imperial vodka served at -18°C and a choice of truffled potato and mushroom vareniki with crispy onion rings and sour cream or meat pelmeni with white vinegar and sour cream. Luckily, we weren't dining alone. So, we got to try both the vareniki and the pelmeni. Both are dumplings and both ample servings were delish. We especially liked the little onion rings atop the vareniki. The caviar was good. The sour cream, awesome. And the warm belinis were delightful (we just wish we'd had a couple more on our plate). According to folks at the restaurant, Bob is keen to be the “number one choice for caviar in London”. We reckon better fish egg delectables can most certainly be had in town, but we don't know of any better value for money caviar offerings. Bob Bob Ricard is located at 1 Upper James Street (at Beak Street, W1F 9DF). 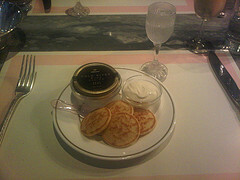 Visit the restaurant online at www.bobbobricard.com.